I've been craving jap chae lately. Jap Chae is a tangle of slippery glass noodles stir-fried with brightly colored, crisp vegetables and dressed with a hint of soy sauce. You can eat it hot or at room temperature. Along with kim bap, it's a great picnic food. It can be made with or without meat. The Korean women in my husband's family don't use recipes, and when I ask them how to make something, their instructions are vague, so I rely on cookbooks, recipes scoured from the Internet, and my own taste buds. This time I started with a recipe I found on Jaden's Steamy Kitchen. 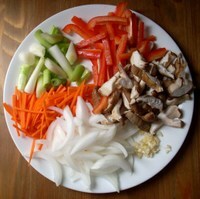 I followed her basic technique, with a few additions like red bell peppers and a little more garlic and soy sauce. There are two things I've learned from watching my inlaws make jap chae: 1) Kitchen shears are key. The noodles in the package are very long, so cutting them with shears after you've boiled them makes them more manageable. 2) The best way to mix everything together at the end (after the jap chae has cooked and cooled) is with your hands. My sister-in-law always has rubber gloves around for this purpose.